According to the ESV site, the new Deluxe Compact edition will be available tomorrow. My Amazon pre-order says it will ship Friday. I mentioned this edition back in February when it was announced, mainly because it will feature a sewn binding, making it a great candidate for rebinding. Given my affection for "itsy bitsy Bibles," it's no surprise that I plan to get a lot of use out of this one. In honor of its coming, though, I thought I might share some photos of the edition I've been using in the meantime. You've seen photos of it here and there, but I don't think I've ever written about this compact ESV at much length. 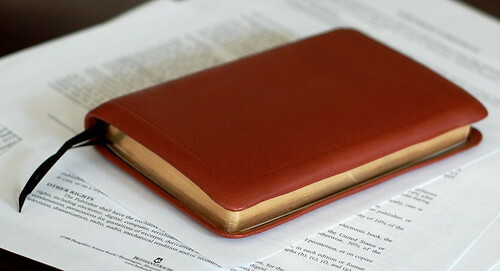 It's an edition that used to be offered by LeatherBibles.com, a compact thinline ESV rebound in supple tan calfskin. (Based on all the talk recently about Abba Bibles, I suspect that's who's responsible for the excellent cover.) 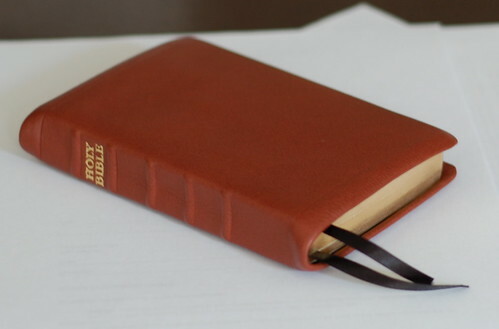 This little Bible is truly a thing of beauty -- the graceful semi-yapp edges, the soft leather, two ribbons. Until you open it up, that is. You see, this edition breaks Rebinding Rule #1: "Start with a sewn binding." Because the compact thinlines are, of course, glued. Because the individual signatures are no longer intact, the text block couldn't be re-sewn in the traditional way. So the needle has to run back and forth through the separate pages. That's why it looks like someone is pinching the inner quarter inch of the text block together. In a sense, somebody is. As a result, the text block won't open fully. 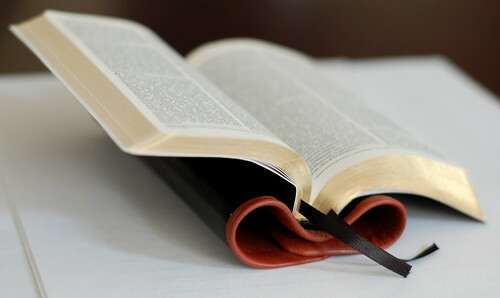 The gutter inside is more pronounced, making it harder to read text nearby, and the little Bible always wants to close itself in your hand. The cover is extraordinarily limp, very flexible, but the text block doesn't play that way. That's what happens when you do remedial work on a glued binding. The results can be quite nice, but there's something incompatible about the project. It never feels like it should, because the text block can't behave properly. It's constrained. Still, I've gotten a lot of use out of this Bible. In fact, its faults probably account for the frequency with which I've employed it. Some editions are so nice you're tempted to coddle them. 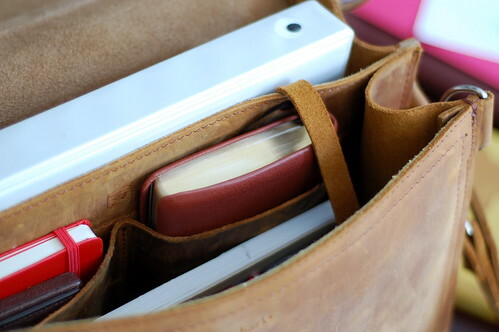 You don't want to scratch the precious cover or crinkle the delicate pages. But I've never felt that way about this one. Because the binding wouldn't open flat, I felt perfectly at liberty to abuse it. Paradoxically, as a result of the punishment, the little thing has improved. The cover is even softer, the page edges are a little dinged, and the binding has loosened a bit (so I can keep it open one-handed, which was tough at first). The semi-yapp edge is more than decorative. Because of the places I've stowed this edition away, the extra leather around the pages serves a protective function. It just so happens that this edition is the perfect size for one of my briefcase pockets. I slide it inside, and the semi-yapp edges keep the pages from rubbing on the case. The lesson here, if you'll allow me to moralize, is that a Bible doesn't have to be perfect to be of great use. In fact, its imperfections may help in that regard, since they help you overcome the temptation to keep it under glass. 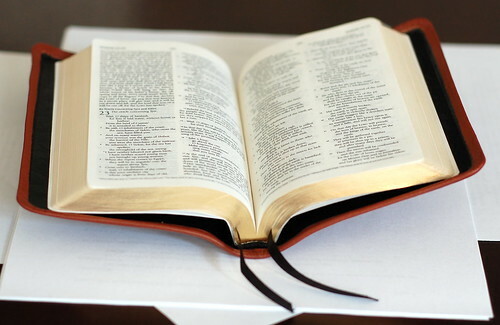 A well-made Bible isn't a museum piece. It's meant to be used frequently. It's meant to stand up to neglect. Like a piece of field-grade equipment, a quality Bible should take abuse, build patina, and develop a craggy character over time. Sure, I was frustrated when I first realized that the binding on this edition wouldn't open properly. Yes, I was tempted to send it back, to lodge a complaint. (And I haven't always been kind in writing about it in the past, in the brief mentions I alluded to earlier.) But on the whole, it's served me well, and though I plan to retire it once the sewn Deluxe Compact arrives, I have a feeling I'll be keeping it handy all the same.